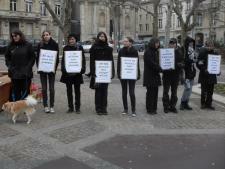 On the World Day for the Abolition of Meat, VegLorraine organized an event in Metz. VegLorraine held a wake for slain animals which was accompanied by a leafleting event. The newspaper Le Républicain Lorrain along with France 3 TV Channel came by. The public was quite receptive, even though the feedback was not always positive. There were many passers by; which gave us great visibility. We had some interesting conversations, but theye were fewer than usual. The actions lasted for two hours; we ended it when we ran out of flyers.